As marketers are using HubSpot to reach an increasingly global audience, it is more important than ever to understand email marketing compliance. A fundamental part of email compliance is understanding the difference between implied and express opt-in consent. Implied consent is given when an individual gives you their email address for some business purpose, but has not stated that they want to receive marketing emails from you. 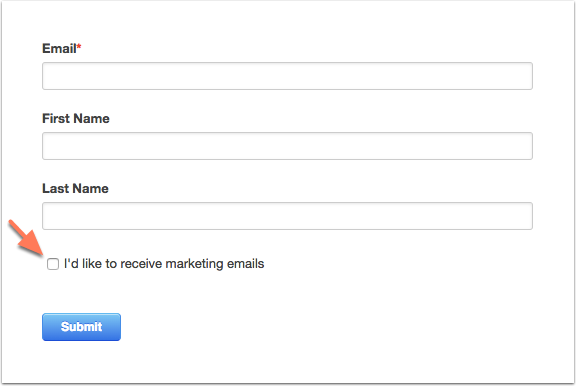 An example could be a contact that fills out a “contact us” form or fills out a form to access a gated resource. Bought or leased a product, good, or service from you in the past two years. Been involved in an investment or gaming opportunity with you in the past two years. Entered into a written or electronic contract with you in the last two years. Made a donation or gift to your registered charity or political organization in the past two years. Volunteered with your charity or political organization in the past two years. Been a member of your organization’s club, association, or not-for-profit volunteer association in the last two years. Express consent is given when you ask an individual for permission to send them marketing emails and they agree. The recipient has to manually opt-in to receive your emails through oral consent, written consent, a click on a checkbox on a form, or through double opt-in. One thing to note is that a form asking for your email address in a form field is not sufficient for getting express consent, but an unchecked checkbox that the visitor must click themselves is acceptable. See the example form below. The best way to gain express consent is by using the double opt-in feature. When confirming double opt-in, an email must actually reach the inbox, and the contact will click a link in an email to confirm they want to receive emails from you. If there are any issues with the validity of the email address, they will never finish the opt-in and you will never have that email bounce and affect your sender reputation. Information: you must give your identifying/contact information as well as the contact information of anyone else you are getting the consent on behalf of. This includes name, mailing address, and phone number or email for contact. They can withdraw consent at any time: you must tell them that if they want to withdraw their consent/unsubscribe, they can. What express consent looks like around the world varies, so be sure to check the mass email regulations for the regions you're emailing. These definitions of implied and express consent should help you navigate those regulations, help you comply, and help you have successful marketing email campaigns.